On Monday, flanked by David Cameron and George Osborne, Sir David Higgins will attempt to restate the case for HS2, ignoring the calls for stations from Liverpool and Stoke, ignoring the calls from Leeds and Sheffield to move the proposed station sites, moving the East Midlands station into the middle of a flood risk area, and announcing that a new station would be built a couple of miles south of the current Crewe station. Whilst Higgins was meant to look for cost savings when he was brought in to HS2, he is not expected to say he has found any cost savings, and just this week it was revealed that the cost of contracts to be tendered for on Phase 1 of HS2 have risen by 11% or £1.15bn. At the same time, George Osborne is expected to announce plans for ‘HS3’ from Leeds to Manchester which with an estimated cost of £7bn for just 40 miles would actually be more expensive than HS2 at £175m per mile. HS2 at £50.1 for 351 miles works out as £143m per mile. 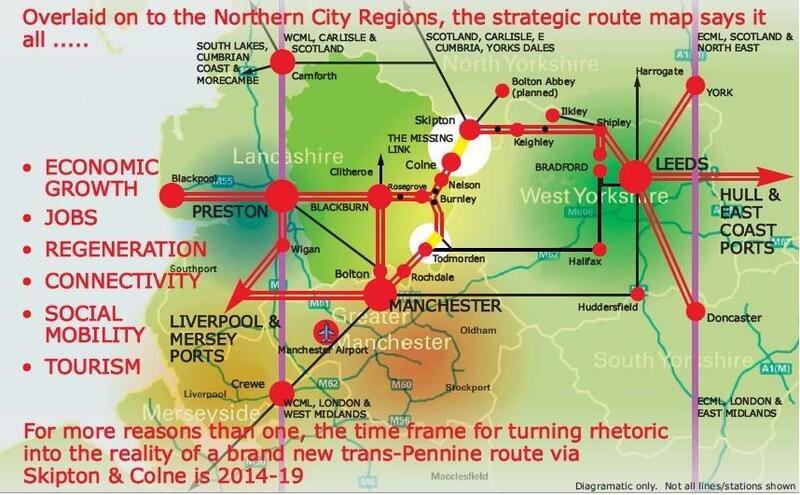 ARUP reported earlier in the year that a new Trans-Pennine route could be built for £110m, or just £10m per mile by restoring the Skipton-Colne line. Pingback: STOP HS2 | Polling shows HS2 more unpopular than ever on eve of another relaunch. This is a most strange analysis of pretence about the location of houses for 9 millions and the motorway through the Chilterns impacts.